We would like to extend our sincere gratitude to all of our partners and customers for their effective cooperation. Over the last 3 years, Vietsmile Travel has had the pleasure of providing travel service to many travelers from various parts of the globe. It is mostly due to the business opportunities with these people that have helped us at Vietsmile Travel to attain the goals that we set for ourselves. We sincerely recognize these business relationships and would like to send a heartfelt thank you to one and all for helping to make Vietsmile Travel it is today. At the early start Vietsmile Travel was a tour operator for individual travelers to visit Vietnam and has since rapidly grown with expansion of its activities to handling groups inclusive over the Indochina. As a result we have reached new heights, to the point that we are not just a ground inbound operator, but more a Destination Management Company for other tour operators, travel agents, incentives houses and tour companies worldwide. At Vietsmile Travel we fully realize that our success depends on customer satisfaction so we are developing the business in own way with a sincere commitment to overall quality. This means that we undertake everything within our power to exceed the Clients’ expectation in terms of quality and value. It is therefore, our aim to provide a cost effective service that is enjoyable, engaging and above all educational. This service should, at all times, be culturally sensitive, eco friendly and as low impact as possible. Since then, we have expanded our operations to include a wide range of travel service for individuals and groups who seek quality service, value and a unique experience in Vietnam. As a innovative company, we are able to offer our clients flexibility in costing and program development. With our offices and extended network of agents throughout the country, it is possible for us to negotiate competitive pricing and ensure the best value for our clients. In addition to this, our first-hand knowledge of the cultures and lifestyles of Vietnam enables us to create unique programs and to customize itineraries to individual requests. The success of our trips and the continuing demand for our service have made Vietsmile Travel the leading Tour Operator in Vietnam today. Because of this we have been able to form alliances with a number of reputable Tour Operators and Travel Agencies in Australia, Europe, Japan, Southeast Asia and North America. Part of these service includes total logistics and contacts through the length and breadth of Vietnam. With our in-depth knowledge of the social, cultural and official aspects of tourism in Vietnam we can help each other to reach our future goals. The infrastructure we have established as a tour operator coupled with our experience and skills have become valued and useful tools in making “our Vietnam” a hassle free holiday destination for people from all parts of the globe. To make Vietnam more accessible and to discover more in a short time, Vietsmile Travel has a team of experienced personnel looking after all inbound tours. Once you establish business relationship with HolylandVietnam, we assure that you will be successful in the travel business in Vietnam market with our seasoned personal service and most competitive price as your interest will always be our prime concern. We had international tour operator Vietnam license that it was issued by VNAT - Vietnam National Administration of Tourism - the governmental office of tourism of Vietnam. 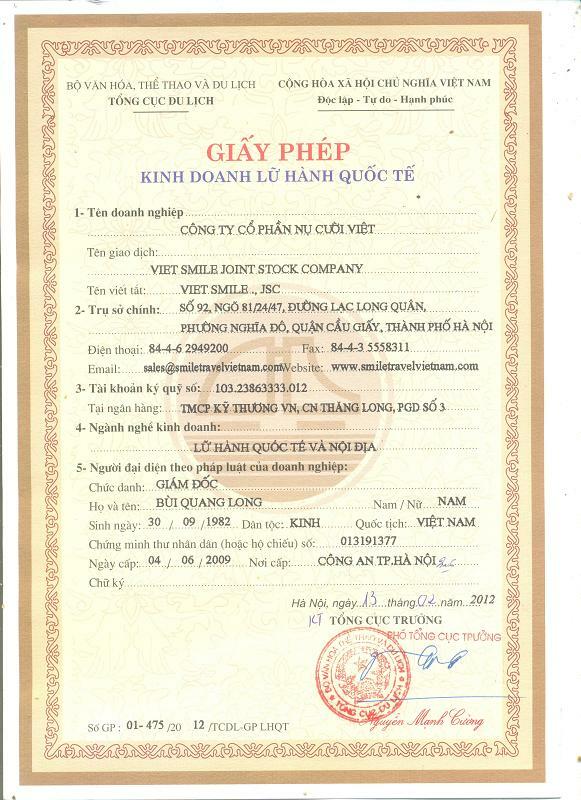 This license is a certification of Vietsmile Travel’s bond at an approved bank to guarantee financial security in respect of customers’ advanced payments as well as the quality of travel services. Issued by: The Planning and Investment Department of Hanoi City. For more information, clients should check with VNAT (Vietnam National Administration of Tourism) to see our reliability. How to check a our licence status: A legitimate company should have details of its international operating licence and its ‘bond’ account number on its web site. Our licence code is 01-475/2012/TCDL-GP LHQT. Our bond account is held by the Techcom Bank: the account number is 103.23863333.012.